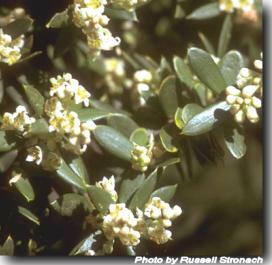 Tall shrub, much-branched or sometimes a small tree. Local on coasts in the north and east. Common component of coastal forest, heathland and dunes. Drought tolerant. Responds well to pruning and can be used for hedging. Not suitable below powerlines. Difficult to grow from seed. Bird-ingested seed or acid treatment might improve results. Never discard seedling trays within 18 months of sowing as germination can be very slow. Propagate from cuttings of fairly soft young growth. Particular care should be taken when handling the minute seedlings because they develop long, fine roots. A well-composted soil is essential and care should be taken not to let plants dry out.